Nancy Possinger encouraged about 20 people visiting Dighton Rock to study the mysterious inscriptions left on the landmark through Viking eyes. 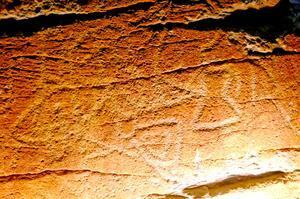 Possinger urged the visitors to look for the Runes alphabet of the Vikings on Dighton Rock. She gave the crowd an informational sheet showing the Viking alphabet and the corresponding letter sounds in English, also providing the meanings behind each of the letters. The Dighton Rock Museum puts forward four theories about the symbols on Dighton Rock, which currently rests in Berkley off Bayview Avenue. Possinger said she doesn’t have an opinion on which theory is correct, but explained that it was an interesting subject to study. “It’s just really fun to come to the rock and to check it out,” she said. An exhibit inside the museum explains the Viking theory. In 1837, Danish scholar Carl Christian Rafn, who never visited Dighton Rock, traced the carvings on the rock to the Norse explorers. Rafn read into the markings and found a message related to the characters in the Vinland Sagas, an account of Vikings in what is believed to be New England. Thorfinn Karlsefni was a Viking leader who Rafn singled out from the Vinland Sagas. Rafn said the Roman numeral characters CXXXI appear on the rock and exactly correspond to the number of men on Kalsefni’s ship: 131. Underneath the numbers is a diamond-shaped “O” followed by an “R” which are parts of “ORFINS” for the name Thorfinn, the installation says. Arthur Miller, who lives across the river from the Dighton Rock Museum, said he believes the Vikings came to Dighton Rock and scrawled the symbols, but added that he believes the Native Americans made markings on it first, before explorers. 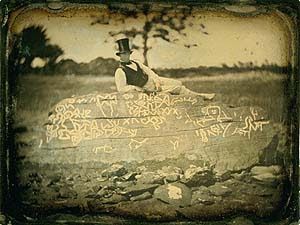 Miller called it a “graffiti rock” for the people of the past. Abby Howes, of Berkley, agreed with Miller and said that Dighton Rock is one of her favorite hangouts. Phil Dann, of Berkley, joked that the symbols on the rock were a political message, saying that Viking explorer Leif Ericson was looking for votes. Hal Rose, of Berkley, said he was open to all the theories but thought the Viking theory was the most convincing. Jim McKain, of Raynham, came to the Viking inscription talk during his first trip to Dighton Rock. The other theories explaining the inscriptions on Dighton Rock attribute the writing to the Portuguese and the Phoenicians, along with the Native Americans. The museum is open every Sunday from 1 p.m. to 4 p.m.